Are you a freshman? Heading off to college? You might need some books and pen, right? I don’t think so. Well, we are living in 21th century where most of our tasks are assisted by computers and I don’t agree that it would be fine with just books and pen. In case you’re unaware, you’re going to have a lot to accomplish while being in college and for that you’ll need a tablet computer with which you can complete your tasks easily and efficiently. 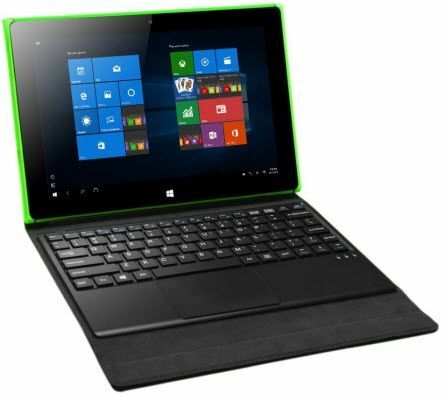 So, in this buying guide, we have picked out some of the best tablets for college students which will help you to take instant notes in classroom and for completing other demanding works as well. You can also chillax awhile in the breaks with YouTube and Netflix. Most of the tablets nowadays are optimized for general everyday use, but there is a number of tablets which are specifically intended to get work completed. They are 2-in-1 computers which can be used as laptop and tablet both. They are standalone traditional tablets until a keyboard is connected to them, means killing two birds with one stone. Most of them run on Windows operating system which I always recommend to the students and businessmen due to its versatility. These 2-in-1 computers are comparatively low in price and offer same specifications as a full-fledged laptop and hence, it becomes a great deal for budget buyers. However, if you want to checkout laptops then we do have a dedicated buying guide for laptops for college students at our site Laptop Under Budget where you can get laptops recommendations for every budget and college majors. 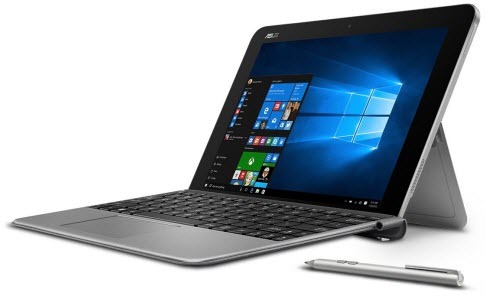 Topping our list of the best convertible for college students is the ASUS T102HA, which is a 2-in-1 touchscreen convertible tablet/laptop with a solid design and compact form-factor. The laptop has also been a global best seller when it comes to a convertible laptop. Speaking about the specifications, the device comes with the latest Intel Atom Quad Core x5-Z8350 Processor paired up with a 4GB RAM for fast and efficient performance. Multitasking on this device is very well handled by the processor-RAM duo. Speaking about the other specifications, it sports a 10.1-inch display with a resolution of 1280 x 800 pixels. For the storage, it comes with a 64GB / 128GB of SSD storage options, for faster, efficient, and reliable file transfers. The laptop being a convertible, can be detached from the keyboard and used as a tablet. Therefore, it comes with a long list of connectivity options which doesn’t let its users to compromise on the productivity. Apart from all the set of powerful specifications, it comes with a premium form-factor and built. Accordingly, it comes with a full magnesium Alloy body weighs less than 1.7 lbs with the keyboard attached and only 0.6 inches thin. It comes with a fingerprint sensor to secure the device and also comes with adjustable hinges to soothe the users, in different modes of usages. The tablet also comes with a pen to support handwriting. This makes the editing of documents and images ease. Thanks to all these aforementioned specifications and features, the ASUS Transformer Mini 10.1″ is evidently the best tablet for college students. 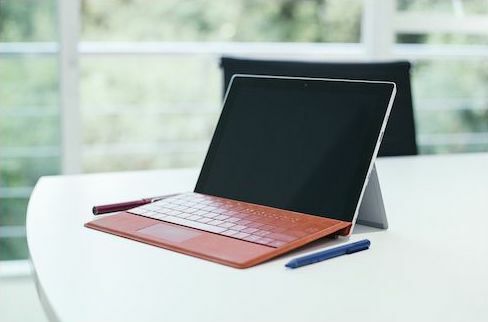 Microsoft Surface Pro 6 has been a globally awarded and adorned convertible laptop/tablet right since its launch in the global market. Powerful beastly specifications, paired with a very compact, and ergonomic form-factor makes this device a global pioneer in the arena of convertibles. Speaking about the specifications, it is powered by 8th Gen Intel Core i5 processor (also available with Intel i7 processor) under the hood. For multitasking, the device comes with a 8GB of RAM which is sufficient for most of the users, however there is an option for 16 GB RAM if that isn’t enough for your work. The storage on the tablet is backed by a 128 GB SSD which is now significantly faster and efficient than the previous generations. On the software front, the tablet runs on Windows 10 Home, which is considered to be one of the most productive OS of all time. What makes this device ideal for college students is its, convertible form-factor and ability to be used as a powerful desktop replacement. The device sports a 12.3-inch PixelSense screen, which has extremely high contrast and low glare so that the users can work throughout the day without straining their eyes. This convertible also supports a long list of compatible peripherals such as Type covers, surface Dock, wireless display adaptor and more. Finally, the device provides 9 hours of continuous usage on a single charge, making it ideal for students and for everyone who requires productivity on the go. 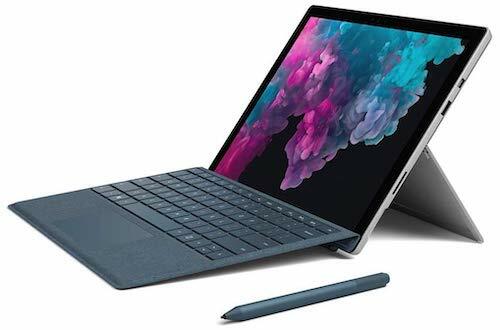 All in all, the Microsoft Surface Pro 6 is one of the best tablets for college students who are looking for a portable and versatile driver that is much similar to a full-fledged laptop. Here comes yet another convertible tablet/laptop in the list. Mircosoft Surface series of tablets are very well renowned in the market for their impeccable and uninterrupted productivity along with solid form-factor. This 10-inch convertible tablet comes with a Full HD display which is pixeled at a resolution of 1800 x 1200 pixels. The Microsoft Surface Go is powered by Intel®Pentium® Gold Processor 4415Y to handle all the operations thrown at the device. Multitasking on the device is backed by 8 GB RAM. Storage on the tablet is backed by 128 GB storage, which is now a constant when it comes to powerful convertibles. Graphics on the laptop are driven by Intel Integrated HD 615 graphics, which does considerably well in handling graphics related tasks. In addition to all these, the Mircosoft Surface Go comes with a 2-MP front camera which is ideal for capturing selfies and video-calling. The voice assistance Cortana, works like a charm with this tablet, and aids the users in most of the daily essentials just based on the voice inputs. 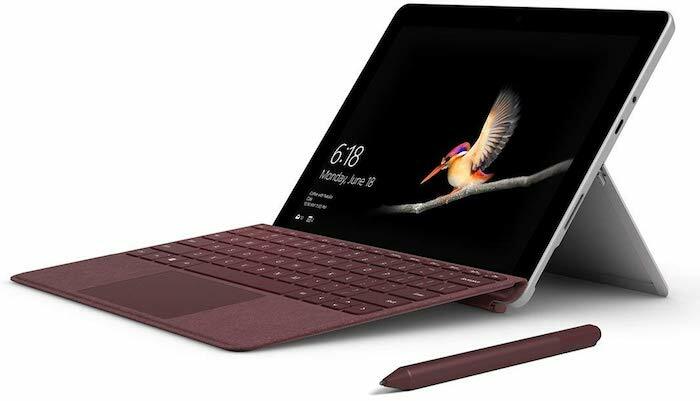 All that said, the Mircosoft Surface Go is one of the best 2-in-1 tablets for college students. Samsung Galaxy Tab S4 is yet another convertible in our list and is also backed by a long list of specifications and attractive features. The tablet sports a 10.5-inch High Dynamic Range on a Super AMOLED display. The display on the device is of a resolution 2560 x 1600 pixels, which delivers cinematic vividness, detail and deep contrast to a screen that fits in your hands. Speaking about the innards of the device, it is powered by a 2.3 GHz Snapdragon 835 Octa-Core Processor paired with massive 4GB of RAM for intensive app handing and heavy multitasking. Storage on the device is bolstered by an internal storage of 64GB/256GB, which can be further expanded via microSD card upto 512 GB. The tablet runs on Android 8.1 Oreo, which is the latest and the most widely used mobile operating system. The tablet is also ideal for photography, as it comes with a 13-megapixel primary rear camera, which can capture moments with great detailing. The tablet gets fully charged in slightly over 2 hours and can provide a backup of about 12 hours on a single charge. 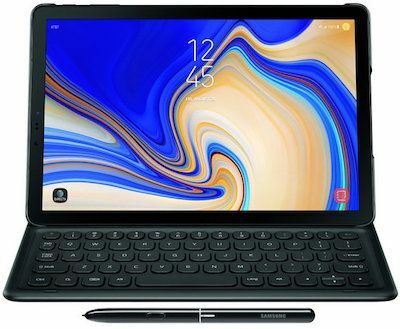 The tablet comes with several other productive features such as multitasking mode, seamless Samsung’s connectivity, and DeX which transforms your tablet into PC. All-in-all, the Samsung Galaxy Tab S4 is a perfect choice for all the students irrespective of their age and major, making it one of the best tablets for note-taking 2019. Apple iPad’s needs no introduction in the arena of tablets. These devices run on the most refined and clean OS created till date. 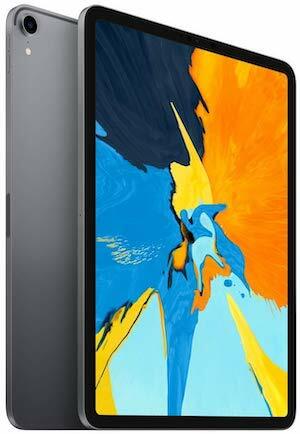 Running on the iOS 12.1, the tablet comes with a large 11-inch Retina display with a resolution of 2388 x 1668 pixels. The display works on Apple’s most advanced display technology which has 120Hz refresh rate and is the brightest and least reflective in the real-world usage. Apple claims that the new iPad Pro is faster than 92% portable notebooks sold in the last 12 months which is insane considering the form factor of the device, and all that made possible with the help of brutally powerful A12X Bionic which is lying under the hoods of new iPad Pro. In simple words, the new iPad Pro delivers incredible responsiveness and is powerful enough to handle complex actions like editing 4K videos and multitasking with ease. The device comes with 4GB of RAM and comes with varied storage options upto massive 1TB which is again a huge plus for users who easily get out of storage real quick. The tablet comes with a single USB Type-C port. The tablet packs a lot of Apple’s proprietary features such as FaceID, and also supports SIM if you opt for cellular version. The tablet supports a really large number of apps for all productivity and entertainment purposes, therefore, making a way in our list of best tablets for college students. As far as note-taking is concerned, the iPad Pro now supports 2nd Generation Apple Pencil which is way more practical and easy-to-use than the previous generation. Unlike its predecessor, the 2nd Gen Pencil sticks to the side of iPad and charges wirelessly while placed in there. Switching between pen and eraser is now seamless with just a tap on the Apple Pencil so you don’t have to reach for eraser tool on the screen every time. The bottom line is that if you have $700 in your pocket to spend, then no tablet comes even close to the new iPad Pro in terms of usability and performance. It’s a total winner and takes the crown for best tablet for note-taking 2019. 6. Apple iPad 2018 Model On Sale! iPad 2018 now supports Apple Pencil. Here comes the second iOS-based Apple iPad 2018, which is a smaller, more compact, and a cheaper alternative to the aforementioned Apple iPad Pro in the list. 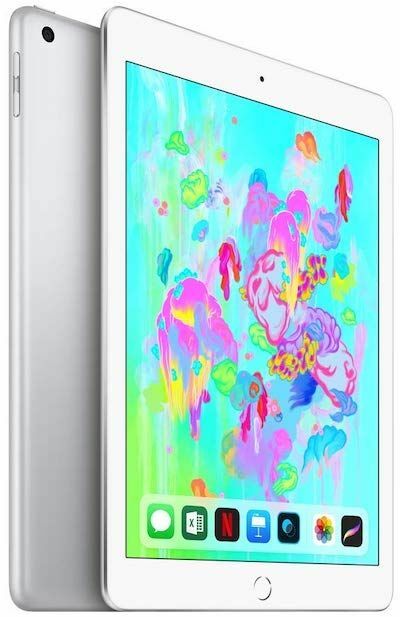 The tablet sports a 9.7-inch Retina Display, which comes with a resolution of 2048 x 1536 pixels. Thanks to its smaller screen size, the display on the tablet generate very accurate colors and has a bright and vivid viewing angles. Speaking about the innards of the iPad 2018, it is powered by Apple A10 Fusion chipset with Six-Core Graphics paired with 2GB of RAM for multitasking and app handling. The tablet also comes stuffed with a pair of really good cameras. It sports an 8 MP iSight primary camera which can record 1080p Full HD Video and a 1.2 MP secondary front-facing camera. As far as storage on the iPad is concerned, it comes with a variety of storage options varying between 32GB / 128GB capacity. The tablet has great ergonomics and comes with a very pleasing aesthetics, making it ideal for everyday usage for a college student. Finally, the best selling point of the iPad 2018 is its battery backup which can easily provide 10 hours of continuous usage on a single charge. All in all, the latest iPad 2018 Model is the best tablet for college to buy in 2019. 7. 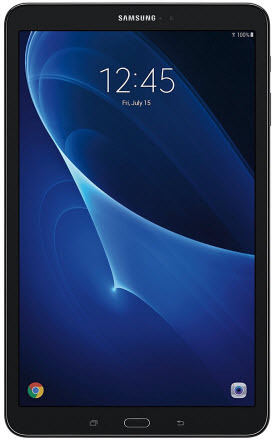 Samsung Galaxy Tab A On Sale! Samsung Galaxy Tab A is the perfect all-purpose tablet for almost everyone, especially for students. It has got a lot of unique and useful features which makes it a perfect tablet for productivity as well as multimedia-based usage. The best feature of this tablet is, it comes with a large and color-rich 10.1-inch PLS-LC Display with a resolution of 1920 x 1200 pixels. It comes with Samsung’s proprietary Exynos 7870 Octa-Core chipset paired with sufficient 2GB of SDRAM for efficient multitasking. It features an 8 megapixels rear camera which is capable to take pretty great quality photos and videos and its 2 megapixels front camera is also ideal for video calling. It runs Android 6.0 Marshmallow straight out of the box and it is also in the queue to receive the latest Android Nougat update. For storing all your work files, favorite movies, and games, it provides 16GB of inbuilt storage and it also features a microSD card slot to further expand its storage. The tablet stays juiced up for over 13 hours of continuous usage on a single charge. The Lenovo Yoga Book is one of the most exciting devices in the consumer market on which you can type, write and copy your physical notes directly on the screen. The other part of the device which is connected to the screen with a stylish watchband hinge is where you can draw or take digital notes. While typing, that part turns into a touch keyboard where you can type on your documents and files. The design is pretty solid and feels premium than the price it comes for which is really great for students who are looking for something significant for their everyday wear and tear. As far as inbuilt ports are concerned, the Lenovo Yoga Book comes equipped with a Micro USB port for juicing up the device, a 3.5 mm jack and microSD card slot for further storage. Talking about the innards of the tablet, the Lenovo Yoga Book houses Intel Atom x5 – Z8550 processor under the hood which is not so powerful and one of the reasons for providing limited processing power is battery life which is why the Lenovo Yoga Book is able to provide whopping 12 hours of battery life on a single charge. Students in search of a tablet for binge-watching and movies-on-the-go, the Lenovo YogaBook’s crystal clear high definition display is perfect and with the Dolby Atmos speakers, the movies will blast through ears. Hence, the Lenovo Yoga Book is flawlessly the best overall package for students whether the primary requirement is note-taking, reading or binge-watching. 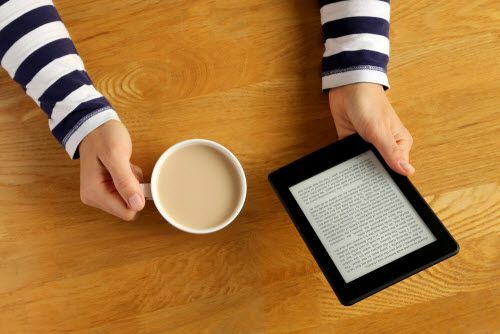 Amazon’s Kindle although being famous for providing economical and feature-packed performance based tablets, this time the brand has come out with a really strong and able set of multi-purpose tablets, under Fire series. One such offering for the company is the Fire HD 10, which is one of the best tablets in the Amazon’s Fire series of tablets. The tablet comes with a decent built and gives a soft-touch finish. The device sports a 10-inch HD IPS LCD which comes with an anti-glare coating on top of it. Unlike most of the other tablets in the segment, this comes with a Full HD resolution of 1920 x 1200 pixels. Speaking about the innards of this device it is powered by a 1.8 GHz Quad-Core processor paired with 2 GB of RAM. Storage on the tablet varies from 32GB / 64GB, which can, however, be expanded upto 200GB via a microSD card. The tablet runs Fire OS 5 out of the box and is, therefore, ideal for both everyday usage and reading purposes for the students. The Fire HD 10 also comes with a personalized voice assistance system under Alexa, which makes it easy for users to give voice commands and questions for quick and reliable answers. 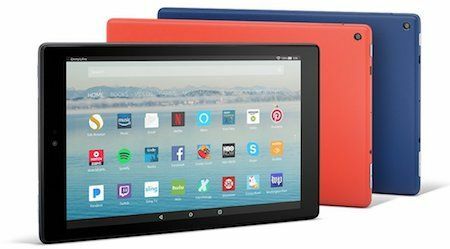 All in all, the Fire HD 10 is one of the best cheap tablets for students who are temporarily looking for a tablet for taking notes and reading purpose, alongside for binge watching with Amazon Prime Contents. iRulu Walknbook is one of the latest and not so popular brand in the arena of tablets. The brand is not so popular and well-known because of it’s recent inception. Otherwise, the tablet boasts a really interesting set of specifications for the asking price. The tablet tuns Windows 10 out of the box and is powered by the latest Intel Cherry Trail Quad-core processor paired with 2GB of DDR3 RAM. The tablet comes with a faster NAND Flash 32GB of internal storage, which can be further expanded up to 128GB via an extendable memory slot. The tablet also supports great graphics in it as it is powered by a HD Graphics inside. Sporting a large, 10.1 inch display with a resolution of 1280 x 800, the tablet makes it easy to use and perform productive tasks such as document editing/reading and more. Apart from all these regular features, the tablet comes with a detachable keyboard and boasts lifetime Mobile Office internally. It supports all the latest connectivity standards and comes with thumping stereo speakers. The entire device is bolstered by a 6000mAh Li-Po battery, which is expected to provide a battery backup of over 6 hours on a single charge. That’s it! These were our Expert’s recommended top 10 best tablets for college students. We tested all of them and found all the goods and bads of them to point them out in this tablet buying guide so that you can make an informed decision to buy the best tablet for yourself within your budget. I’m taking a 3 year Computer Security and Investigations program in September 2018. I have an Alienware computer at home, would I be ok to just purchase a tablet for school? I was thinking the Microsoft Surface Pro 4. The Microsoft Surface Pro 4 is one of the best mixtures of portability and performance out there and I would really recommend it to the students looking for something capable. I personally have used the Microsoft Surface Pro 4 for my work and all I can say is everything is on point from performance to battery life. However, it seems like your usage will be from medium to high as you mentioned you want it for Computer Security & Investigations program, so the one with either Intel i5 or i7 is advisable. I wanna tab with a large screen but with a low buget…what’s the best gonna be for me???? Regardless of your requirements (since you didn’t mention it), Fire HD 10 is the tablet I would recommend to someone on a low-budget. It has all the features one would expect from a 10-inch tablet, a good Full HD display, Dolby stereo speakers, long-lasting battery and a Quad-Core processor. The Fire HD 10 is an ideal tablet for streaming contents online, browsing the web and reading. The tablet doesn’t come with a keyboard like other tablets in this list however you can get a compatible Bluetooth keyboard to hook up with the tablet if you type a lot. I’m very interested in the Amazon Fire HD 10 but I’m concerned that you can only get apps from amazon. Does this mean I won’t be able to get Microsoft word and other apps for school that I use daily. I know these apps are in the Google play store but not in the Amazon store. The Fire HD 10 won’t support MS Office and sadly there are no alternatives available for Fire OS to open your Word documents or Excel sheets. However there is a way to install Play Store on Fire tablets by doing some scripting which we won’t recommend. Hello, I am a second year university student, looking mainly for compatibility and long battery life. I am currently using a laptop which is perfect in every aspect except for its short battery life and heavy weight. It bothers me to look for a plug every time I visit a cafe or a library. Basically all I am looking for is a not too small but light tablet with a long battery life that will be ideal for reading, document work and watching online lectures. I am not planning on using it for any games or entertainment purposes. What would be your best suggestion, considering that my budgets anywhere less than $500, idealy. I think for the requirements you mentioned, an iPad would be a great choice. Apple recently launched iPad 2018 which is specifically designed with students in mind. It now adds support to Apple Pencil with which you can take notes in class very easily. And, as far as battery life is concerned, no tablet can ever beat an iPad with the massive 10 hours of screen-on-time on a single charge. Moreover, the 9.7-inch Retina display on the front is super bright and sharp to read. It isn’t available on Amazon as of now but you can order it right now for $329 (Wi-Fi,32GB) on Apple’s website.